On the verge of summer of this year 2006, the largest English-speaking country in the world (the USA) approved by a large majority vote (85 %) of its Catholic Bishops, the new translation of the “order of Mass” from Latin to English. Will this decision impact on the relation of Traditional Catholics to their majority brethren in the Conciliar Church? Will it narrow or widen the divide? Will it reduce the area of conflict? For example of a benefit, in the newly approved version, when the priest says “The Lord be with you,” the people are to respond, “And with your spirit” (instead of “And also with you”). This word spirit affirms the existence of the soul. In the Confiteor, the sense of sin is fortified by these words, newly restored: “Through my fault, through my fault, through my most grievous fault.” Other detail improvements could be pointed out. One could counter, however, that the moves are merely rearranging the deck chairs on the Titanic. The essential thing is that worship in the renewed Conciliar Church still today remains gravely damaged on account of the Latin Roman Missal published back in 1969 by Paul VI. The damage was aggravated by the deplorable English translation of it done by ICEL, a translation happily on the point of being replaced by the “new ICEL,” under its recent Vatican appointees, eager now to translate more faithfully. 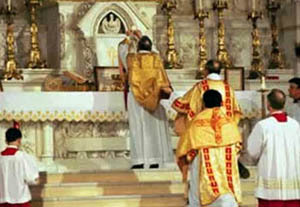 A major foundation of this new zeal for liturgical fidelity was an “Instruction” from the Vatican, issued March 2001, and titled Liturgiam authenticam (LA). 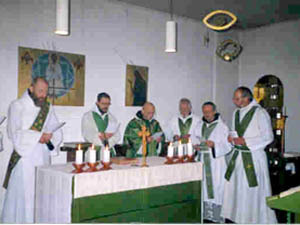 Its topic was precisely rules for the translation of the Liturgy. In my opinion, those rules should have been laid down back in 1968 when the new liturgy began to appear. I would even have suggested that the Vatican itself and not the ICEL should have translated the new Liturgy into the principal modern languages. The Vatican would not dream of submitting its papal encyclicals and other major governing documents to the whims of some committee answering to Bishops. Now, even more important than encyclicals to the life of the Church is the Mass. It is the weekly and daily public affirmation of the Church’s being and belief. Moreover the Vatican has a team of professional translators for the major languages. Why did the Vatican not itself provide us with a prompt and professional English translation? Was it too preoccupied with the turbulent happenings in the wake of Vatican II? Was it bewildered in the face of a task that had never arisen before? Was it a secret conviction that the Holy See should not even dream of translating that most holy rite that has sustained the Church and her martyrs for fifteen centuries plus? I do know that some English-language Bishops (one of them told me so in 1964 at an early ICEL meeting) put their heads together in 1963, probably over a cappuccino on the Via della Conciliazione in dear old Roma. And they said, “What if the English speaking Catholics get flooded with ten conflicting translations of the Mass? What if we can’t agree how to recite the Creed?” And so ICEL was born, not a Vatican creature, but a creation of Bishops. 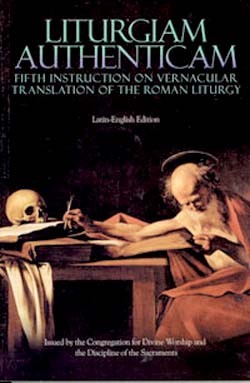 The faulty translations of liturgy, especially those in English by ICEL, were what later helped drive Rome to publish Liturgiam authenticam, in an attempt to restore order. Do these positive intentions describe well the practical consequences that came over the Church when the new Missale Romanum (1) and its new Ordo Missae were applied? Sad to say, they do not. The Catholic Church has undergone not a reaffirmation of her glorious past but a revolution of her liturgy. The revolution was so violent that the churches, the religious orders and the seminaries began rapidly to empty. 1. 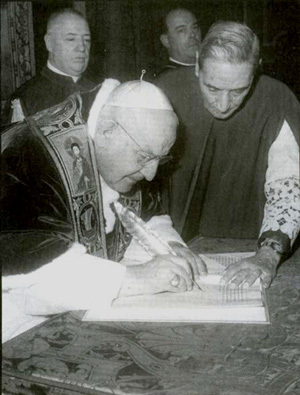 The Apostolic Constitution Missale Romanum promulgated by Paul VI on April 3, 1969, presented two documents: the Institutio Generalis Missalis Romani [General plan for the Roman missal] and the Novus Ordo Missae [New ordinary of the Mass]. The Institutio includes 341 articles in which the new rites are minutely explained. It also establishes theoretical and practical principles for the Eucharistic celebration. The Ordo Missae includes the new text of the Mass and the new rubrics for its celebration. Let us consult the teaching of the Instruction Liturgiam authenticam, on the rules for translating the Liturgy and Scripture. LA says that translating the liturgy is not creative innovation, but rendering the original text faithfully and accurately. This is a serious principle of liturgy. There is an axiom: “Liturgy is not created but received.” It is a given sacred. It is performed, repeated, carried out regularly and without alteration. This has been true of all the Catholic rites in all ages. Never in Catholic History has there been any sudden, major change in her liturgy, never, until Vatican II. Yet, after Vatican II approved Sacrosanctum Concilium in 1963, there began a tremendous revolutionary change in the Catholic Liturgy, brought about by the so-called Consilium group under Fr. Annibale Bugnini, (later Archbishop). It was a veiled but gross violation; it was not cautious and conservative change as expected by most of the Bishops. It was a harmful “innovation” (LA, n. 1) and not a “faithful and accurate rendering” of the ancient Missale (cf. LA, n.20). If all this is so, why was the Bugnini group allowed to compose that radically new and suspect liturgy? Why did the Liturgy fall into the hands of revolutionaries? By the year 2000 the liturgical and ecclesial collapse, on the one hand, and the small but strengthening traditionalist movement, on the other hand, insistently demanded of the Vatican stronger measures, including a return to Catholic traditions of worship. 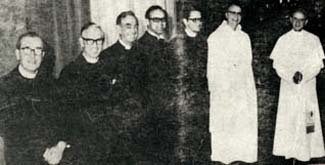 Accordingly, the writers of the Liturgiam authenticam instruction had to deal with the weaknesses of the new liturgy of Paul VI without causing a loss of face, without admitting the serious mistakes of Vatican II, without openly denouncing Annibale Bugnini (who in 1976, was promoted to Apostololic pro-Nuncio in order to be quietly removed to Iran). How does LA deal with the crisis? LA skillfully arranged the text to begin with the title words, Authentic liturgy. This evokes “authenticity,” genuineness, respect for ancient authority, for tradition, and fidelity. It suggests a serious effort to restore what the revolution had damaged. 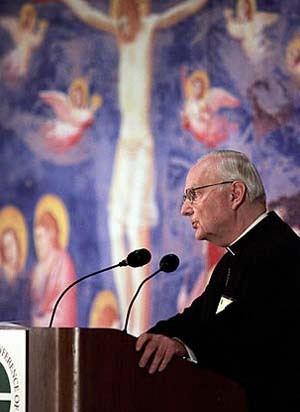 But in order to placate and reassure the modernist and progressivist elements who are certainly still dominating the Church, those pro-tradition remarks are always partnered with calls for renewal, for “adapting the ancient spiritual tradition to the genius of the various peoples” (LA n. 1). This is really a meaningless bit of puffery, but good window dressing. The duty of all the peoples is to adapt themselves to Jesus Christ and His Gospel, a task faithfully achieved in the Old Mass and Sacraments. We are facing a Catholic collapse through the past four decades since the Vatican II Council (1965), a collapse especially evident in the Liturgy. Let us ask a blunt question: Did the Vatican authorities suffer any embarrassment, or regret, or guilt? As far as I can see, the strongest Vatican document since the collapse started is precisely Liturgiam authenticam. It runs over 50 pages, denouncing the errors in current translations of the post-Vatican II liturgy and insisting firmly on better rules for rendering into English the official Latin Mass and Sacraments, along with the denunciation elsewhere of abuses in celebration. With this supposedly corrective document, the Vatican officials appeared to be hoping to rebuild the Catholic House, so gravely damaged by falling Catholic standards. It would be a partial “reform of the reform.” It would make the Mass sound more attractive and reverent. Let me explain. LA features two strong and opposite movements. The first is preserving, looking to the past; the second is adapting, looking to the future. Preserving evokes words like respect, reverence, fidelity, tradition, authenticity, indefectibility, wholeness and intactness. Adapting calls forth reform, change, renewal, revision, organic growth, inculturation, pastoral necessity. All these words occur in LA. But forthwith LA adds, “Adapt [the liturgy] to the genius of the various peoples with the purpose of renewal [intended by] the Council.” This I do not understand! What is that “genius of various peoples”? Must the one Catholic liturgy express every national culture? Jesus says, “Preach the Gospel (not adapt it!) to every creature” (Mk 16:15), and St. Paul adds that we are “predestinated to be made conformable to the image of His Son” (Rom 8:29). It is the peoples, and not the liturgy, who must conform. Furthermore, was “renewal of the liturgy intended by the Council”? It is easy to say so. But what is actually said by the Council is there must be no innovations unless the good of the Church genuinely and certainly requires it (SC, 23). In the Novus Ordo Missae that appeared in 1969 (and is still in rule), huge portions of the Tridentine Mass (the Offertory, Roman Canon, scores of orations) largely disappeared. This is not renewal or organic development. It is obliteration. Organic development of liturgies is to be measured rather in centuries. It is not a quick fix by a council committee. As for the vague term “renewal” or renew, it is never used in the Gospel; it is used only four times by St. Paul and each of these denotes an action of God, not of man. I think that I see “renewal” now as a great Vatican bluff word of the post-conciliar period, suggesting that the “Holy Council,” and, the Holy Spirit, be credited with the recent so-called “renewal” of Church and liturgy. Instead of renewal, it has been an immense degradation. The writers of LA continue to put a bold front on their elaborate attempt to vindicate the Vatican II liturgy. It says, “(Thus) began, under the care of the Supreme Pontiffs, the great work of renewal of the Roman rite [and its translation] with the purpose of … that renewal … a foremost intention of the Council” (LA, n. 2). Let me comment on this phrase “under the care of the Pontiffs?” Yes, indeed. The Freemasons had been scheming for a century to get a liberal, modernist or progressivist Pope elected. After infiltrating many of their members into the priesthood and the episcopacy, it seems they finally succeeded with John XXIII. He and his successors consistently fostered the ideals of Freemasonry. They also mostly chose progressivist candidates for future cardinals. Paul VI forbade the older cardinals to vote for future popes, the better to influence future elections. Was this planned renewal a “foremost intention of the Council”? It was of the Council leaders, doubtless so. As for the rank-and-file Bishops who care about the Mass, most of them certainly did not plead for a radically different Mass and the wrecking of the Tridentine Mass. And only a small minority wanted an all-vernacular Mass. The Bishops, in sum, were manipulated by the powerful and well-prepared minority in the Council. Knowing these things as we do, we now hear LA intone: “The liturgical renewal has thus far seen positive results” (LA, 3). I am aghast! That line sounds like “positive peanuts!” Is it “damning with faint praise”? What a pathetic and well deserved evaluation of the tawdry new Catholic liturgy machine! I am not speaking with bitterness. I gave over 30 years of my life as a priest to make the best of the New Mass. I served on several diocesan liturgy commissions, I directed a Cathedral choir, I was editor of a National Missalette. Then, rather suddenly and quite by God’s providence, not by my own art, I saw once again (O bless my soul! ), I saw the surpassing truth of the Old Mass. And I returned to it. 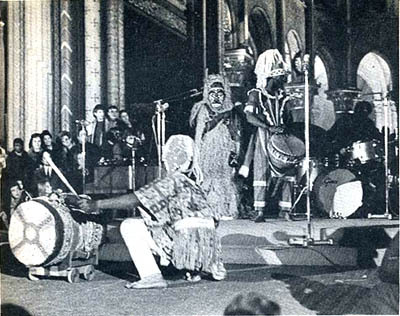 Yet LA now shifts into reverse, and calls for “revision … in accordance with sound tradition”! But tradition is precisely something that one does not revise. Would you re-write Charles Dickens’ A Christmas Carol? Or repaint the Mona Lisa? Or change a Mass that has been a glorious fixture for fifteen hundred years plus? The Vatican Congregation for Divine Worship (CDW) is the true name of our antagonist behind LA. Their members are the iconoclast striving to conceal, or if possible to justify, the huge act of liturgical destruction perpetrated by them and their earlier collaborators about 35 years beforehand, when they revised The Roman Rite virtually out of existence by their bold changes. The more we ponder these questions, the harder it becomes to expect an easy reconciliation between the Vatican, spellbound by such secular forces, and the traditional Catholic remnant, striving to maintain the old Missale Romanum and Catholic traditions. Let us conclude our reading between the lines of Liturgiam authenticam by one more return to § 20. In it, our Liturgy is being highly praised as the fruit of centuries of transmitting the Faith from the time of the Fathers. Then, suddenly, it is called the “fruit of the liturgical renewal just recently brought forth,” meaning the new liturgy and new missal put together by the Consilium committee. It seems to me that there is little reverence, authentic flow, or organic vital bond between the two: the Missale Romanum of Trent and the Missale Romanum of Paul VI. The Mass of all ages (above), reverent in all aspects, is poorly replaced by the New Liturgy, even in a supposedly conservative version. I have quoted LA above (n. 20), that the “translation is not a work of creative innovation [but] rendering faithfully the original [Latin] texts.” I shall now replace a few small missing words, words that I actually deleted from LA, because they were obscuring and confusing this truth, so that readers would likely not notice the enormity of what the new liturgy has done. Here now, is the text with the restored small words: “The translation is not SO MUCH a work of creative innovation AS IT IS OF rendering faithfully the original texts.” Behold! Innovation is here cleverly and unobtrusively justified, as long as there is not so much of it as there is of a faithful rendering. And who will measure this? I have been trying to show my readers, sometimes with blunt language, that the New Mass is a destruction, an obliteration, a sacrilege, a violent revolution. It is certainly not a careful and reverent retouching of the Roman Missal, even if the necessity of this were conceded. Most conciliar Catholics do not see or grasp this, from long habituation to the new ways and the restoration of sufficient bits of tradition, the better to deceive. I must conclude: Liturgicum authenticam, for all its wise words on translation, is a great deception. It stands by that re-write (in Latin) from modernist and ecumenical minds, of the whole Roman Liturgy. Amid all the surviving fragments of truth or worship or goodness, there is an overarching trend, or tendency, toward heretical Modernism. To say this liturgy in Better English is all the more deceptive. Preserve, Yes. Adapt, No. Remember that great maxim, “Lex orandi, lex credendi” – The law of praying determines the law of believing. Pray the new conciliar Liturgy enough Sundays, enough months and years, and you will believe according to the new conciliar faith, which has led a large majority of Catholics astray. Astray, or … away. We should applaud and respect the good words of LA on how to translate. Let us heed them when translating. But let us demand good words of Latin in the first place, not bad words of Modernism, be the Latin of it ever so elegant. For they say, and do not. (Mt 23:3). Is the Catholic Crisis Really Explained?